Photo above: Appropriations Chair Maggie McIntosh presents her committee’s budget actions on the floor of the House of Delegates. For the last eight years, Republican lawmakers repeatedly tried to cut the governor’s budget and were beaten back by Democrats. Tuesday, Republicans in the House of Delegates tried to prevent cuts and changes they didn’t like in the budget proposed by Republican Gov. Larry Hogan. The roles may have been reversed, but the outcome was the same. They were beaten back in largely party line votes by Democrats who insisted they were trying to help the governor achieve his budget cutting goals. The differences were actually fairly minor overall in the $40.4 billion budget that got preliminary approval after just three hours of explanation and debate. The decisions made by the House Appropriations Committee on Friday were left intact as the House approved accompanying legislation to change dozens of formulas, mandates and entitlements to keep the budget in balance. But in the end, the committee added just $278 million to what Hogan had proposed, but even with those additions, the overall state budget goes up just 1.3% from the final O’Malley budget. Here is a summary of the committee actions, the full report of the Appropriations Committee, and reprints of the budget bill, HB70, and the Budget Reconciliation and Financing Act, HB72. Republicans tried to reverse budget changes that they said tied Hogan’s hands in making further budget cuts or moving money around. Del. Tony O’Donnell, R-Calvert, objected to a budget amendment that would prevent Hogan from using money dedicated to building the Purple or Red light rail lines for any other transportation projects. 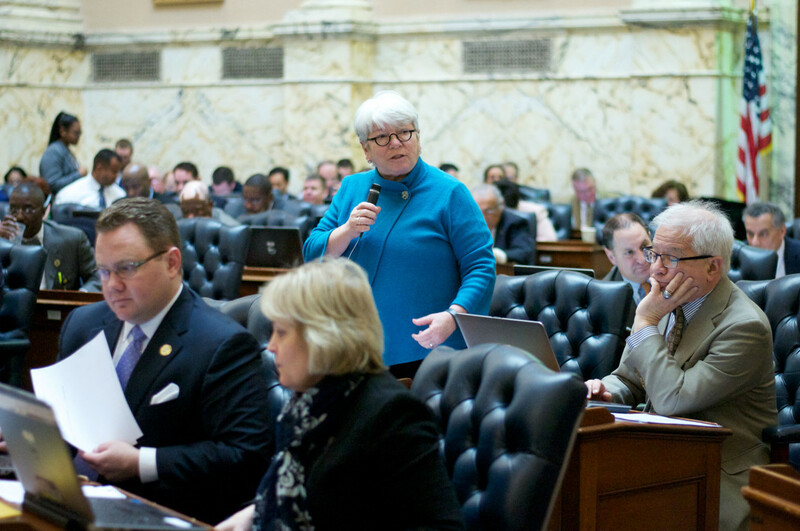 O’Donnell called that “unnecessary constraint on our executive’s ability” to act, but the amendment prevailed in an 86-53 vote with several Democrats joining the Republicans in opposing the restriction on Hogan. Other Republican delegates objected to elimination of 50 vacant positions in both the Department of Public Safety and Correctional Services and the State Police. That would still leave 676 unfilled positions in prisons, parole and probation, and 180 in the State Police. McIntosh explained that the positions were cut, but the money to fund them was left so the governor could cut it himself as part of promised budget trims. “We’re trying to help the governor achieve the 2% across-the-board cut,” she said. She complained that the committee had tried and failed to get specifics on where the 2% cuts would be made by any agency. “We have yet to get one answer about where they’re going to get the cuts,” McIntosh said. “This is an action he didn’t ask for,” said House Minority Leader Nic Kipke. “This reduces the number of [correctional] officers to get the job done,” said Del. Pat McDonough, R-Baltimore, Harford counties. Del. John Cluster, R-Baltimore County, made a similar complaint about the State Police vacancies. The Appropriations also “fenced off” $68 million for the Geographic Cost of Education Index, money Hogan must appropriate in a supplemental budget but cannot use for any other purpose. The index is used to give more money to areas where costs are higher, such as big suburban counties and Baltimore city. “The committee has tied his hands,” said Del. Tony McConkey, even though he admitted Hogan favored more school funds. “I would love to give the governor flexibility on education,” McConkey, R-Anne Arundel, said. After all the committee amendments passed, Republicans also attempted to strip money in the budget for the several thousand abortions Medicaid pays for every year. Those amendments failed as well.